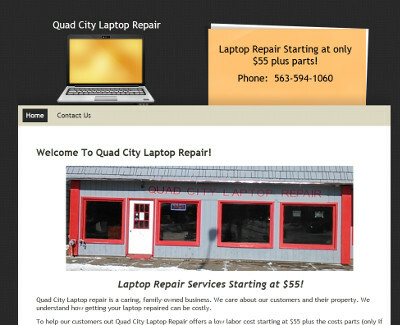 John, the owner of Quad City Laptop Repair, contacted us a few weeks ago asking about website design services. After answering his questions and understanding how he had his website hosting and domain names pointed, we sent out the initial pre-payment invoice to him this past weekend. On Monday (yesterday), he sent us the information we needed to start on his website design. In a little over 24 hours, we took his information that was provided and created his website, one that is very eye-appealing and hits home his main selling point for his business regarding his laptop repair. John was very satisfied with how quickly we got the site up and running and says that he will most likely be adding more functionality to the site later on. He noted “Glad to work with you, BIG THANKS! !” in an e-mail to us. We appreciate the business from John and Quad City Laptop Repair!